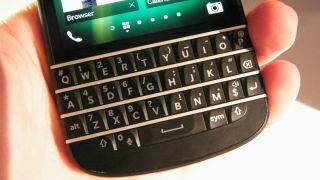 The BlackBerry Q10 release date has been set for April, but not all countries and carriers will enjoy the QWERTY keyboard goodness from then. Although it was announced alongside the BlackBerry Z10, the Q10 has been held back by BlackBerry so consumers could focus on the fully touchscreen, flagship model. TechRadar was initially told that the BlackBerry Q10 would arrive six to eight weeks after the Z10, and BlackBerry looks to be staying true to its word. A statement from the Canadian firm reads: "We expect the first global carriers to launch the BlackBerry Q10 in April. We will announce new pricing and availability information as carriers roll out around the world. "We are working closely with our carrier partners to accelerate their testing process, but cannot offer any specifics on US availability." The Q10 is the first handset to feature a QWERTY keyboard alongside the firm's new BlackBerry 10 operating system and it will certainly appeal to those who can't live without a physical input method on their smartphone. You can find out what we made of the second BB10-touting handset in our hands on BlackBerry Q10 review.